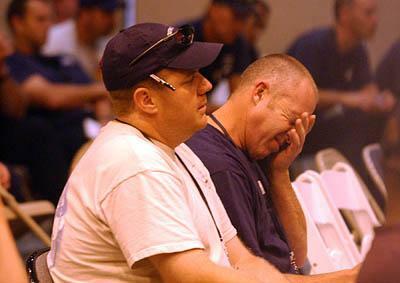 Firefighters endure a day of FEMA training, which included a course on sexual harassment. Some firefighters say their skills are being wasted. 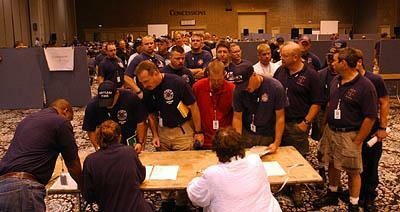 Firefighters line up Monday in Atlanta to give their names to FEMA personnel drawing up deployment lists. Many will be assigned to hand out fliers. The firefighters - or at least the fire chiefs who assigned them to come to Atlanta - knew what the assignment would be, Hudak said. One fire chief from Texas agreed that the call was clear to work as community-relations officers. But he wonders why the 1,400 firefighters FEMA attracted to Atlanta aren't being put to better use. He also questioned why the U.S. Department of Homeland Security - of which FEMA is a part - has not responded better to the disaster. On Monday, two firefighters from South Jordan and two from Layton headed for San Antonio to help hurricane evacuees there. Four firefighters from Roy awaited their marching orders, crossing their fingers that they would get to do rescue and recovery work, rather than paperwork. "A lot of people are bickering because there are rumors they'll just be handing out fliers," said Roy firefighter Logan Layne, adding that his squad hopes to be in the thick of the action. "But we'll do anything. We'll do whatever they need us to do." While FEMA's community-relations job may be an important one - displaced hurricane victims need basic services and a variety of resources - it may be a job best suited for someone else, say firefighters assembled at the Sheraton. "It's a misallocation of resources. Completely," said the Texas firefighter. "It's just an under-utilization of very talented people," said South Salt Lake Fire Chief Steve Foote, who sent a team of firefighters to Atlanta. "I was hoping once they saw the level of people . . . they would shift gears a little bit." Foote said his crews would be better used doing the jobs they are trained to do. But Louis H. Botta, a coordinating officer for FEMA, said sending out firefighters on community relations makes sense. They already have had background checks and meet the qualifications to be sworn as a federal employee. They have medical training that will prove invaluable as they come across hurricane victims in the field. A firefighter from California said he feels ill prepared to even carry out the job FEMA has assigned him. In the field, Hurricane Katrina victims will approach him with questions about everything from insurance claims to financial assistance. "My only answer to them is, '1-800-621-FEMA,' " he said. "I'm not used to not being in the know." Roy Fire Chief Jon Ritchie said his crews would be a "little frustrated" if they were assigned to hand out phone numbers at an evacuee center in Texas rather than find and treat victims of the disaster. Also of concern to some of the firefighters is the cost borne by their municipalities in the wake of their absence. Cities are picking up the tab to fill the firefighters' vacancies while they work 30 days for the federal government.